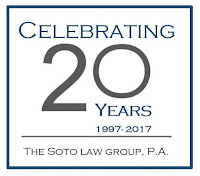 The Soto Law Group is Celebrating 20 Years! On the 20th Anniversary of the Soto Law Group, P.A., we pause to thank our clients, friends and colleagues who have supported us during these past 20 years. We have been fortunate to represent both multi-billion dollar businesses and family owned enterprises always striving to deliver an effective solution to problems, small or complex. In the days to come we will be reaching out to personally thank the clients who have been with us during the last 20 years and with good fortune for the next 20 years. Now is not the time to reminisce of war stories, deals and trials [there are plenty of those] but to reflect that it has been a successful journey starting almost 30 years ago by the firm’s founders and carrying forward to this day and all along the way supported arm in arm by colleagues and friends. We look forward to continuing our valued relationship as a trusted advisor. The Partners, Associates and Staff of The Soto Law Group, P.A. Partners, Felena R. Talbott, Esq., and Oscar E. Soto, Esq., successfully tried to Jury Verdict a post completion construction defects action against the General Contractor of a 25 million dollar medical facility in Miami Dade County, Florida. The Owner argued that certain items of work were not properly constructed nor repaired during the warranty period. The cost of remediation exceeded 2 million dollars. The General Contractor asserted that the work was inspected and approved despite contemporaneous project records identifying deficiencies in the work. The claims at trial centered around improper supervision, coordination and construction of a below grade multi floor garage and the HVAC system at the project. The Trial Judge has entered a Final Judgment on the Jury Verdict. The firm represents companies and individuals in Business, Construction, Employment and Insurance matters.